Did the warriors of ancient Sparta simply vanish without a trace along with their city, or did they find sanctuary in the Mani region at the tip of the mountainous Peloponnese? That stark, unforgiving region's roots today run deep with a history of pirates, highwaymen, and neighbors ferociously repelling any foreigner foolishly bent on occupying this part of Greece. Less well recorded are the Mani's families' strict code of honor and their history of endless vendettas with neighbors and with their own relatives. No wonder their farms look like fortresses. 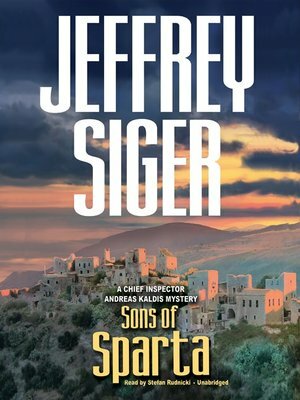 When Special Crimes Division Detective Yiannis Kouros is summoned from Athens to the Mani by his uncle, Kouros fears his loyalty to his boss, Chief Inspector Andreas Kaldis, is about be to be tested by family pressure on him to act in some new vendetta, for this uncle once headed the Mani's most significant criminal enterprise. Instead, Kouros learns the family is about to become rich through the sale of its property—until the uncle is killed and so too the deal. Acting swiftly to head off a new cycle of violence, Kouros satisfactorily solves the murder—or so it seems. Back in Athens, Kaldis' probe into deeply entrenched government corruption leads straight back to the Mani. Both detectives now confront a host of unexpected twists, unanticipated players, unanswered questions—and people yet to die.